Highly incompetent exploding Mexican vampires fail to murder two loose cannons with dorky haircuts who have kidnapped a sad southern family. From Dusk Till Dawn was written by Quentin Tarantino on commission for $1,500 with the intention of it being a sort of calling card for the make-up artist who did the ear make-up for Reservoir Dogs. Robert Rodriguez directed the film...and our best guess is pushing us toward believing that cocaine may have also become involved in the process somewhere along the way. 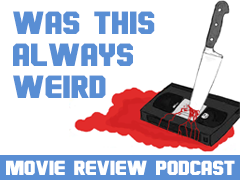 Lance Gilstrap (Movie Riot, Midnight Society) joins the hosts to breakdown the many questionable aspects of this movie from its special effects laden second half to a theory that the film takes place in the mind of Cheech Marin.